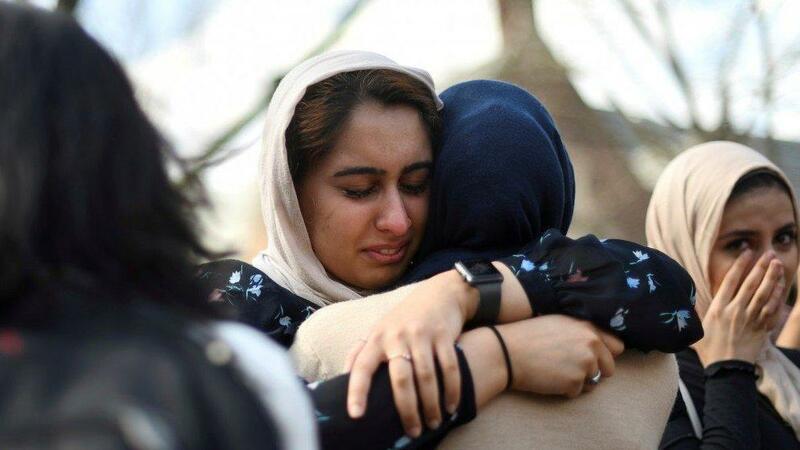 At the University of Pennsylvania in Philadelphia on Friday, Nayab Khan, 22, cries at a vigil to mourn for the victims of the Christchurch mosque attacks in New Zealand. Over the weekend, Muslim mental health professionals quickly pulled together a webinar to share advice on how to deal with trauma after the New Zealand terrorist attacks on Friday. A white supremacist killed at least 50 people as they prayed in two mosques. Psychiatrists and spiritual leaders doled out advice on self-care and how to help young Muslims work through this moment. "The concern for all of us who are working in the mental health field and in the community is 'What is going to be the long-term impact of this persistent exposure to trauma that our kids are facing right now?' " said Dr. Farha Abbasi, a psychiatrist at Michigan State University. That trauma didn't start on Friday. In the U.S., while many young Muslims wept over the loss of life and the hate that drove the killings, they said they weren't surprised. They're a generation that has been raised on a constant barrage of anti-Muslim rhetoric since the Sept. 11, 2001, attacks. For most of their lives, if not all of their lives, the U.S. has been at war in Afghanistan and Iraq; elected officials from across the spectrum have questioned their patriotism and their loyalties. Meanwhile, mass violence has become almost commonplace, with schools across the United States holding mass-shooting drills for children and, in the past few years, rising numbers of hate crimes against American Muslims and other minorities. "Every given day there are more Muslims dying, either by these terrorists, in the name of terrorism or in the war against terrorism. But how the trauma is being internalized is what concerns me," Abbasi said. Because Muslim life, she said, can feel like it's worthless to others. "We already know that trauma can be very disruptive. It's like your story is cut off. Suddenly it takes away your sense of safety, your sense of predictability, but it can also impact your ability to trust, relate, connect, and you feel very isolated and disconnected." Abbasi points to statistics that show young Muslims are feeling more alienated. Muslim parents report bullying in K-12 school at nearly double the rate of Jewish kids and at more than double and triple the rates of Protestant and Catholic school-age children, respectively. In some cases that bullying is coming from teachers. A survey from the Pew Research Center found that about two-thirds of Muslims don't think other Americans see them as mainstream. "Post-9/11 there is a more concerted effort to demonize Muslims, to make us the other, sort of the foreign threat and the enemy," said Kameelah Mu'Min Rashad. She's the founder of the Muslim Wellness Foundation, which promotes healing and emotional health in American Muslim communities. That message is what the 15- to 20-year-olds she counsels have heard their whole lives. "Unfortunately for them it feels commonplace," she said. "From extremely horrific events like what we saw happened in New Zealand in Christchurch to daily microaggressions and invalidations of their identity. And so I am very proud of how resilient American Muslim youth are. And I'm also very concerned about the onslaught and sort of daily erosion of their humanity." Every day these young people are asked to prove their worth and their humanity, she said. A vast swath of American Muslim adults are young: At least 35 percent are between the ages of 18 and 29. Many have multiple identities that are marginalized and threatened by white supremacy — black Muslims, queer Muslims, undocumented Muslims. It's all too familiar for Nayab Khan. She's a 22-year-old student at the University of Pennsylvania. "I've only lived in a period where Islamophobia, anti-Muslim rhetoric, is always present, everywhere I go," she said. "Whether that be the eighth grade, being called a terrorist for the first time, or whether that be the shooting a few days ago." The daily aggressions have shaped her identity. She goes to the corner store near her apartment, and someone calls out, 'Go back to your country'; she gets on the train, a woman yells at her. It's part of being visibly Muslim. She's a Pakistani American who wears the religious head covering, the hijab. "It's very exhausting and very laborious to always, one, have to constantly be explaining yourself," she said. "And two, attempting to normalize it, when in reality I'm Muslim and I'm different and that's who I am." So now Khan is active on campus with the Muslim Student Association. She organized a vigil after the Christchurch attacks, and she's building coalitions with other groups who combat white supremacy, xenophobia and racism. Seventeen-year-old Noor Bowman of Philadelphia says the anti-Muslim stuff barely registers with her anymore. "As a young person growing up, they shape your experience and the way you see the world around you," she said. "I'm so used to it that when people mention it, I'm like, 'Oh, I do experience microaggressions and different things.' But unfortunately it's become a part of everyday life." Things like people calling her derogatory names for an Arab — she's African-American. Telling her to go back to her country — she's from Philadelphia. So she has learned to be resilient. "Hatred against Muslims and other minorities has always been there, you know, since 9/11. And for people of color ... since basically forever here in this country," she said. "But I think that there are moments in history — and I think this is just history repeating itself — things change in our environment or [in the] political climate where people have heightened hatred or their hatred is emboldened." That moment, she said, is now. At school she has taken on the role of someone who speaks out when her identities as a black Muslim woman are demonized or questioned. "I'm definitely an ambassador and not because I'm forced to be but because I want to be," she said. "I am very vocal in standing up to some of the things that are in our textbooks [or] are said by our teachers that are incorrect or inaccurate," she said. "I'm more than happy to be the ambassador and say, 'Hey, this is not appropriate,' because if I'm not, who will be?" An earlier version of this story incorrectly said that more than two-thirds of Muslims don't think other Americans see them as mainstream. In fact, it's about two-thirds. The terrorist attack in New Zealand that killed at least 50 people as they prayed in their mosques sent shockwaves throughout the world. But in the U.S., many young Muslims say they weren't surprised. They're a generation that has been raised in the midst of anti-Muslim rhetoric, wars in Iraq and Afghanistan, mass shootings and now rising hate crimes. As NPR's Leila Fadel reports, mental health experts are worried about the lasting impact on this generation. LEILA FADEL, BYLINE: Over the weekend, Muslim mental health professionals quickly pulled together a webinar to share advice on how to deal with trauma after an event like New Zealand. Dr. Farha Abbasi is a psychiatrist at Michigan State University. FARHA ABBASI: What we see now and is the concern for us - all of us who are working in mental health field and in the community is, what is going to be the long-term impact of this persistent exposure to trauma that our kids are facing right now? FADEL: Abbasi says this kind of persistent trauma like anti-Muslim rhetoric can rob a person of their sense of safety, their ability to trust and connect. She says young Muslims are feeling more alienated. They're more likely to be bullied at school than their peers by classmates but also by teachers. And a survey from the Pew Research Center found that more than two-thirds of Muslims don't think other Americans see them as mainstream. Kameelah Mu'Min Rashad is the founder of the Muslim Wellness Foundation. It promotes healing and emotional health in American Muslim communities. KAMEELAH MU'MIN RASHAD: Post-9/11, there is a more concerted effort to demonize Muslims, to make us the other, sort of the foreign threat and the enemy. FADEL: So, she says, that's what the 15- to 20-year-olds she counsels have heard their whole lives. RASHAD: From extremely horrific events, like what we saw happen in New Zealand in Christchurch, to daily microaggressions and invalidations of their identity. FADEL: It's commonplace for them, Rashad says. RASHAD: I'm very proud of how resilient American Muslim youth are, and I'm also very concerned about the daily erosion of their humanity. FADEL: Every day, these young people are asked to prove their worth and their humanity. And many, she says, have multiple identities that are marginalized - black Muslims, queer Muslims, undocumented Muslims. It's all too familiar for Nayab Khan, a 22-year-old student at the University of Pennsylvania. FADEL: The daily aggressions have shaped her identity. She goes to the corner store near her apartment, and someone calls out, go back to your country. She gets on the train. A woman yells at her. It's part of being visibly Muslim. She's a Pakistani-American who wears the religious head covering, the hijab. KHAN: It's very exhausting and very laborious to always, one, like, have to constantly be explaining yourself and, two, like, attempting to normalize it when in reality, like, I am - I'm Muslim, and I'm different. FADEL: So now Khan is active on campus, building coalitions with other groups who combat white supremacy, xenophobia and racism. Seventeen-year-old Noor Bowman says the anti-Muslim stuff barely registers with her anymore. NOOR BOWMAN: You know, as a young person growing up, they shape your experience and the way you see the world around you. And sometimes, you know, I'm so used to it that when people mention it, I'm like, oh, I do experience, you know, microaggressions and different things. But unfortunately it's become a part of everyday life. FADEL: Things like people calling her derogatory names for an Arab - she's African-American - telling her to go back to her country. She's from Philadelphia. So she's learned to be resilient. At school, she's taken on the role of someone who speaks out when her identities as a black Muslim woman are demonized or questioned. Leila Fadel, NPR News. Transcript provided by NPR, Copyright NPR.